A friend of mine once suggested that Koreans have contributed nothing laudable to the modern cultural collective. A tad harsh perhaps, though given the culturally devoid trite that is k-drama and k-pop, she may have had a point. In my opinion though (Psy aside), Koreans get a bad rap and deserve a little bit more credit then they are typically afforded; Korean cuisine is a case in point. Along with the ubiquitous kimchi, Koreans could also teach the world a thing or two about how to barbeque. Whilst not to everybody’s taste, Korean cuisine has only recently made its mark on the international food scene. Its spicy flavours are gaining popularity at an astounding pace and is the current darling of Asian-fusion cuisine (did somebody say kimchi taco?). Typically considered the preserve of Antipodean, South African and American cultures, the Koreans are in fact prolific barbequers. Koreans will barbeque virtually anything, but they especially love their beef. Be it sliced steak (bulgogi) or strips of beef short ribs (galbi), the Koreans take great pride in their barbequing traditions, and with good reason – it tastes incredible! So what makes a Korean Barbeque Korean? As with any barbeque, the secret is in the marinate. 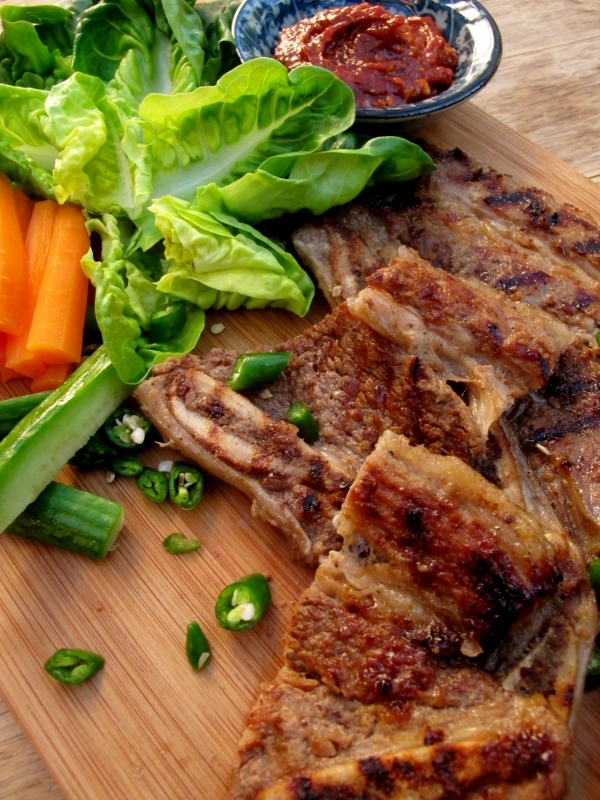 Sweet and salty, the marinate for galbi is a triumph of flavour, both familiar and exotic. The addition of puréed pear not only adds sweetness, but also helps tenderize the meat. Whilst the marinate works well with any cut of meat, galbi is specifically made with beef short rib. The way the meat is cut is also slightly unusual, in that it is thinly cut across the grain and along the bone. Each slice of meat should include 3 pieces of bone and can be grilled whole or divided into three pieces and cooked individually. If you can’t source this particular cut of meat, the marinate will also work a treat on pork or any beef cut. Another thing that sets Korean Barbeque apart is how it is typically served. 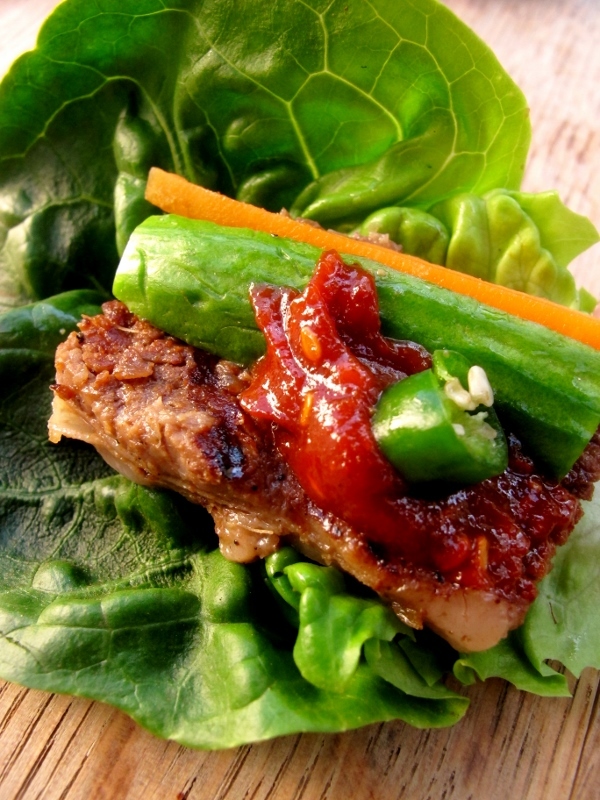 Apart from the traditional Korean side dishes (banchan) stalwarts of rice and napa kimchi, galbi is normally cut into bite sized pieces, wrapped in a lettuce leaf along with some carrot, cucumber and chilli. It is then smeared with a spicy Korean sauce called ssamjang. Rice aside, this is Banting/LCHF Bliss personified (just leave out the honey/sugar)! Note: Whilst you can get away with marinating your meat for less time, ideally this marinate needs at least 18 to 24 hours to work its magic.